Preserving flowers is a lovely way to enjoy their cheerful presence all year round, even in the dark months when you would otherwise be longing for some colourful blooms. Wax flowers are a great way to preserve your fresh flowers as well as protect them to extend their lifetime. Wax flowers can also become the basis of other crafting activities such as candle making, and the resulting blossoms make wonderful gifts. Making wax flowers is not hard, nor does it require a great deal of equipment. The item you will need in the largest amounts will be your flowers. These blooms should have been picked and dried previously. You will also require an appropriate amount of paraffin wax, a bowl or other receptacle for holding the molten wax, and a heat source to help you melt the wax. A cookie sheet, ideally covered in parchment paper, should also be kept on hand throughout the waxing process. Once you have your equipment gathered, making wax flowers is as simple as melting the wax and dipping the dried blossoms until they are completely covered. To melt the wax you can either put the paraffin in a bowl and apply a heat source directly or experiment with making a bain marie by placing the bowl on top of a pot of bowling water. When the wax is heated through, gently dip the desired flowers and then place them on the cookie sheet. When the sheet is full, move it to the refrigerator to allow the flowers to dry and harden. When completely cool and set the blossoms can be removed and stored in a cool, dry place. The unused wax can be retained for the next time. Wax flowers make lovely decorations on their own, but can also be used as the basis for home-made candles. If desired, a wick can be added just before the wax flowers cool. This wick can then be lit to create a candle. However, it must be remembered that these candles should be watched carefully because once the wick burns low there is the risk that the flame will touch the dried flowers and cause them to burn. Floating waxed flower candles in a bowl full of water is a good idea if they will be lit. Waxed flowers can also be floated in water without becoming candles as a nice centrepiece, or they may be used to decorate tables. Waxed flowers also make thoughtful gifts, though it is best to determine if the person you intend to give them to has a love of flowers. Displaying arrangements of wax flowers can also make people smile and may be appreciated as a donation to a local hospital or community centre. Just be sure to check if your donation will be appreciated before bringing it over. Wax flowers are a cheap and cheerful way of keeping some of the beauty of your garden alive for a longer time. 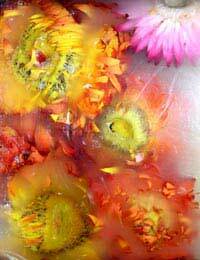 If you are experienced with drying flowers then you are half way to make wax flowers yourself. The next time you cut some beautiful blooms, consider extending their life by waxing them. Have fun!